Mayor Duggan announced on Sept. 9 a proposal to create the Great Lakes Water Authority which will hand control of the Detroit Water and Sewerage Department to the suburbs and ultimately pave the way for its privatization. The creation of the GLWA without voter approval violates the Charter of the City of Detroit and Michigan State Constitution. This is why Governor Synder and Emergency Manager Kevyn Orr are using Detroit’s bankruptcy to steal DWSD from the people of Detroit. Veolia Water has been hired undertake a “peer review” of the Detroit’s water system, looking for ways to lay off workers and cut labor costs, while neglecting to review the legality of the $537 million in infrastructure improvement funds transferred to Wall Street to settle dirty swaps deals. In 2002, a Veolia CEO was convicted and fined millions of dollars for fraud by the U.S. Securities and Exchange Commission. Corruption, bribery and embezzlement are still part of Veolia’s sleazy corporate culture. Veolia recently disclosed accounting fraud amounting to $120 million in the U.S. from 2007 to 2010. Veolia has a history of treating workers badly, often leading to strikes. Veolia likes to impose lower wages and reduce retirement, health care and other benefits; break contracts; enforce lower work standards detrimental to workers and the community; and reduce the workplace environment to levels below safety standards. Contempt for workers’ safety is just one of the issues leading to strike actions in several cities and countries. 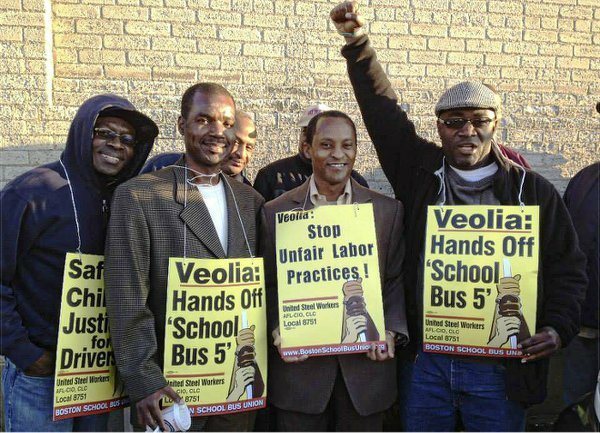 The lockout of protesting Boston school bus drivers was the third time Veolia had serious conflicts with workers in 2013, following strikes in Los Angeles and Finland. This global company has a long history of attempted union busting. In 2012, after two years of failed negotiations, Veolia Transportation workers struck for 11 days in Phoenix and Tempe, Ariz., after the National Labor Relations Board found Veolia was negotiating in bad faith and reneging on previously agreed issues. After failing to get Veolia to seriously negotiate for more than a year, workers in Florida struck for a day. A community campaign there finally forced Veolia out. Internationally, Veolia’s anti-labor policies have led to strikes in England, Canada and France. In Stockholm, Sweden, Nov. 18 has been declared as a day of protest against the anti-union policies of Connex, which is owned by Veolia Transportation. On Sept. 27, Connex fired a leader of a Swedish Union of Service and Communication Employees (SEKO) local for publicly criticizing the company’s poor safety and working conditions. As the world’s largest water privatization business, Veolia is infamous globally for profiting at the expense of the environment and the public. Worldwide consumers of Veolia’s privatized water have experienced high prices, poor service, limited oversight and the discouragement of water conservation efforts in their communities. Veolia has cost numerous municipalities millions of dollars in the cleanup of wastewater and untreated sewage dumped illegally into waterways; in damage to water treatment plants as a result of neglect; in injuries to workers; and in the unfair denial of pensions and other benefits. Veolia has been sued for breaking state contracts and overcharging residents. Globally, managers at Veolia-controlled plants have been charged with corruption, bribery, embezzlement, kickbacks and falsifying reports. Veolia has an extensive history of questionable environmental practices. In Indianapolis, the company’s lack of safeguards led to a “boil water” advisory for more than a million people, forcing local businesses to close and school to be canceled for 40,000 students. In Kentucky, Veolia’s cost-cutting led to diesel contamination of the water supply, after the company deemed that the equipment to remove the fuel was too expensive to operate. In Illinois, a Veolia subsidiary operating a hazardous waste incinerator for more than 10 years was fined more than $3 million for small explosions that released toxic chemicals, including carcinogenic dioxins, into the air. In Ohio, a Veolia Environmental Services plant housing several 200,000-gallon chemical tanks exploded in 2009, injuring workers and damaging more than a dozen homes. Veolia Energy currently manages wastewater from hydraulic fracturing for natural gas and oil. This highly toxic byproduct of fracking contains carcinogenic chemicals and has been found to be radioactive. Given Veolia’s track record, its plan to discharge some of the water back to local waterways should be cause for considerable concern. Veolia’s privatization in Puerto Rico was considered a world-class consumer disaster. The British Environmental Agency listed Veolia as the second worst polluter in Britain. From Africa to Latin America and Asia to Eastern Europe, Veolia’s drive to privatize water has left a trail of debt, destruction and growing opposition. Veolia has operated bus lines through the occupied West Bank of Palestine, connecting illegal settlements to Israel. The Veolia buses use roads built on land stolen from Palestinians, while servicing only Israeli settlers. While global pressure forced Veolia to sell off these bus lines in September, the company still operates light-rail services to illegal Israeli settlements in East Jerusalem, and owns and operates the Tovlan landfill in the West Bank, where it dumps refuse from Israeli settlements. Veolia also provides wastewater services to the settlements. Veolia’s consistent profit-over-­people practices have spawned “Dump Veolia” movements. In Escambia County, Fla., Amalgamated Transit Union Local 1395 assembled a coalition that included the NAACP, the Rainbow Coalition, Occupy Pensacola, churches, bus riders and disabled groups, which succeeded in running Veolia out of town. In Indianapolis, New Orleans, Atlanta and other U.S. cities, as well as in Paris and cities in Belgium, Germany and Romania, communities have taken back their water and transport systems from Veolia and restored public control, improving operations and lowering costs. Much of this material originally appeared at workers.org.